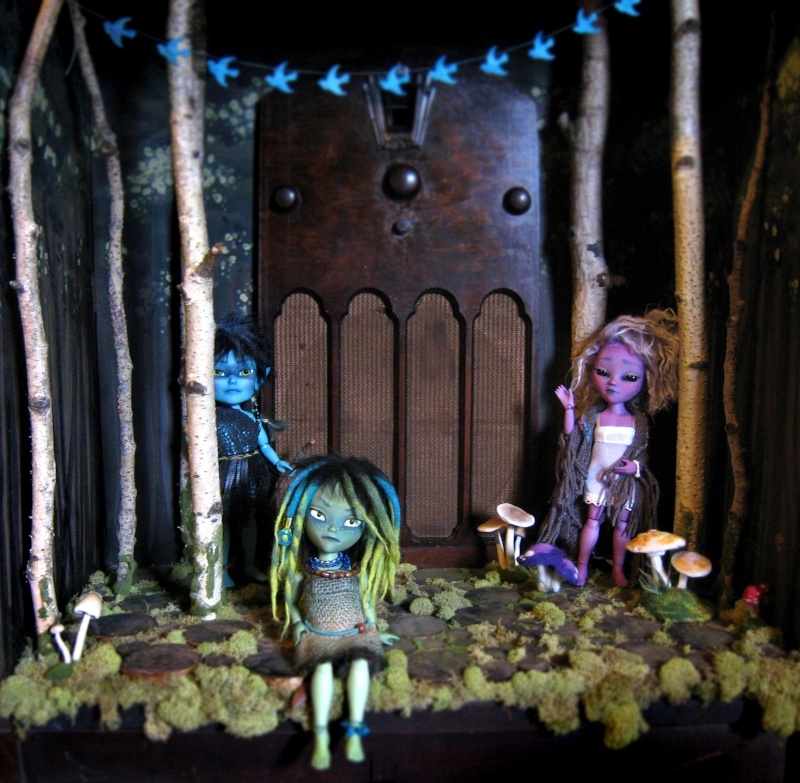 I want to share my progress on a magical foresty diorama home for my woodland bunch. It has been the focus of my creative efforts post 3-DP body makies (still crying on the inside, really). I used the interior of a non-functional antique radio cabinet found at auction for $7-$10 (can't remember which exactly, but super affordable). It works great because I can leave it downstairs and it blends in from the front. Only I need know that it contains a small dolly world, but let's be honest, I'm probably going to show every poor sucker who walks into the house. 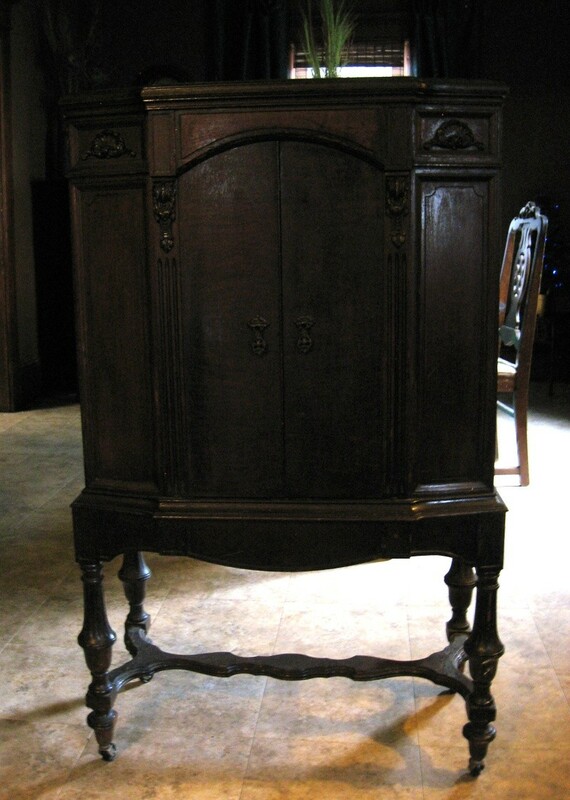 Here is the exterior of the cabinet. I like its imperfect finish, dings, uneven stain etc. Here is the interior. There are still a bunch of things I may add, like lighting, trim around the unfinished back wood, some tree fungi, a larger toadstool for sitting...It should keep me busy for a while. I should also add that the wooden piece with the knobs is removable so that the interior can be set up and viewed from the front the doors open. They look great in there; it's beautiful! What a great find, too. So cheap! The cabinet is charming. I think lights are a great idea, but it's so great as is. You've really made me want a "ship" for Theral and her crew to hang in my living room. Wow! That's amazing. It looks great. I love the mushrooms. That is absolutely incredible work you've done, truly amazing! I don't dare let my 3 see it. Right now they think that a single shelf of their own with some Ikea furniture would be an out-of-this-world treat. Luckily they are content to share space with my 18 inch girls for now. It's exquisite, and absolutely enchanting! That is one of the things I love about miniatures too, how people can take old wooden clock cases, or an old piece of a hollow log, and create a borrower's house, the home of a family of field mice, or some other magical realm. "In my life there have been no dragons... only stepping in gum, and small spiders. I would have preferred dragons." That's beautiful! I love the little bird garland. Jupi - I'd love to see a "ship" set for your crew! Finding space for every awesome idea these guys inspire is difficult. SydneyGrey - I made the brown and white mushrooms from some poly clay, and the rest I needle felted. Mushrooms fascinate me, ha. ForestGreen - Your makies are lucky, they live in a world with giants! JRyu - I agree. There is something so inviting in the mystery of tiny worlds that exist just beyond our own, and how miniatures bring those ideas to life. Perhaps that is the child or the escapist in me. DollYay - Morel (the purple character) loves to listen to bird song, and requested the garland in order to animate with her magic and sing to her on occasion. I marvel at your very focused theme. I seem to be all over the place and haven't settled on a theme. When I was a child I used to disappear into the undeveloped lots in town. They usually had a stream and trees with cave-like areas near the bottom which I fantasized were homes for my small acorns or stones that represented small families. It was a secret world and no one knew where I went. I don't even remember sharing it with friends. That's what your diorama makes me think of. My first makie was a gift to my 30 something daughter who was not at all interested. She also asked me to change her identity so she became Brenda Starr, a cartoon 40s and 50s reporter. I bought many items from my daughter's life-her dog, rug, running outfit, ice cream and sushi. When she became Brenda I got large old cameras, typewriters, old phones, and started making retro outfits and bought Barbie professional suits, etc. Now I bought my Korean girl, Nari Kim, because I watch lots of k-dramas. She is contemporary. So I have a computer, cell phone, Kim Chi, bulgogi rice, trad Korea garb, the new makie's photo career stuff, etc. for her. They have a Barbie picnic table and chairs to eat dinner together (pretty timeless). But I'm not sure how room mates from two different times will work. I've been watching a lot of original Star Treks and they use the different time theme a bunch. I'd love to hear anyone's ideas for a story of why these two are together to guide me in a future direction. Any ideas? Thanks DocC. My theme for these three is cohesive, but the rest of my Makies are all over the place. The rest are: a mini me, and mini husband, a Youtuber look alike, two adopted coco girls and a random premade makie. They mingle, but I'm not sure they are all from the same universe. You make me feel better! Love the story ideas. Thank you! I hope that it all becomes clear when they hang out together! Maybe Brenda was sent out to report on a strange anomaly that suddenly appeared in a farmer's field. The anomaly turned out to be a time vortex. Brenda, curiosity overcoming her, approached too close, and was helplessly sucked in, only to be spit out into the current century. There she was befriended by a kind Korean girl, fellow reporter?, college student?, scientist?, etc.? Ever the intrepid reporter, Brenda is recording her adventures as she explores this bright new century, in hopes that she may one day return to her own century with her news breaking story! Lol, can you tell I'm a 40s and 50s Sci-Fi fan? That's a great story! I love that she's hoping to get back to write the scoop! Yes I can tell you are a 40s and 50s sci-fi fan! I can see Nari Kim roll her eyes when Brenda dolls herself up with fem dresses and red lipstick. Nari is not such a dutiful Korean girl. She is independent but fiercely loyal to friends. She helps Brenda with articles by taking photos with her digital slr and explaining 2015 culture to her so she can be a reporter in this time. haha, I have at least three "stories" and three shelves for my Makies. The sci fi lot end up mixing with Harris and Cat a lot anyway (who are from a sort of xmen-like universe where everyone's a mutant and has some sort of power). Then there's the modern fantasy group. » Wonderful diorama with Roseate Spoonbill from Phil!